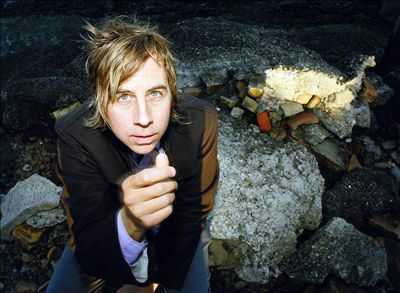 John Vanderslice has a reputation for being one of the nicest guys in the music biz. The 43-year-old singer-songwriter has been on the scene as a solo artist for more than a decade, and also served as proprietor of San Francisco-based recording studio Tiny Telephone for nearly 15 years, so needless to say, he’s garnered quite a bit of a following. Outside of the music world, he is not only a charismatic individual, but instantly likable, due in large part to the genuineness of his spirit. His diction is peppered with the words “like” and “totally” and he speaks with a thoughtful and somewhat restrained confidence. As he talks, he emanates a real enthusiasm in the oft-boyish charm that encompasses his words and belies his age. And on this particular Friday night, he’s amped up on the release of his latest album, “White Wilderness,” on the Dead Oceans label, just days earlier. He answers the phone as he’s arriving at Arizmendi Bakery to pick up cookies for him and his wife to enjoy at home, something which constitutes a big night out for Vanderslice. “My wife Isabelle is, like, the coolest person on earth,” he said of his bride of more than four years, a native of France. Vanderslice, who once was employed as a waiter, said that working evening shifts on the weekend never bothered him so much. And even now that he’s moved on from the profession, he still prefers to spend Friday nights at home. One of the luxuries of being a solo artist is having those weekend nights free to stay in. And Vanderslice, who is a veteran of a handful of indie rock bands, finds that being an independent solo artist is much more liberating for him overall, in the sense that he’s able to make his own decisions, worry about only his own schedule and perhaps most importantly, do things on a faster timeline. While that formula works quite well with his relentless personality type, as someone who has released – on average – an album a year in the past decade, Vanderslice is surprisingly not always overflowing with inspiration. But luckily, he said he always recharges, even if it sometimes takes longer than he’d hoped. And it’s the experience of traveling around on tour that gets him back in songwriting mode. As for who or what he uses as a sounding board with the music he writes, Vanderslice said that his wife and other musicians he collaborates naturally are subject to it. But more than anything, the music has to – first and foremost – sit right with him. Things that fall under the umbrella of what Vanderslice typically worries about include: if a song is mixed well, if it’s interesting, if it’s true to the body of work he’s already produced, if the song holds up well as a musical idea and ultimately, if he wants it released. However, in the past year, Vanderslice has been stepping out of that role more and more in the creation of his newest work, the aforementioned “White Wilderness.” Instead of utilizing the standard singer-songwriter formula that he has become famous for, this album features a live collaboration with The Magik*Magik Orchestra. The two first appeared together in January of last year, during the 10th Anniversary Celebration of Tiny Telephone. But the history begins before that, when the orchestra’s director, Minna Choi, approached Vanderslice via e-mail, asking if they could be the official orchestra for the studio. The idea of such a collaboration, which Vanderslice described as “genius,” was so perfect, in part, because it’s not such a common occurrence. Aside from the initial appeal, Vanderslice also found himself impressed with Choi’s resume and attitude. Those attributes became even more apparent from the initial moment the two began working together. And not only did the orchestra become a studio staple, but ended up facilitating the major framework of Vanderslice’s next album. In fact, he relinquished almost total creative control to Choi in the composition of the nine tracks. While it was indisputably new territory for Vanderslice, it was also – in a sense – the necessary next step in the evolution of his music, albeit one which was admittedly not intrinsic to his nature. And although he only provided the skeletal work for the songs, even with the full orchestration, they have his trademark sound and style all over them. The most noticeable difference between “White Wilderness” and the Vanderslice repertoire’s predecessors is the amount of time that went into it. Where Vanderslice previously spent months and months agonizing over every detail of his past releases, the entire new album was recorded and mastered in three days. In fact, he referred to the ability to leave those mistakes in not as a show of weakness, but rather a sign of confidence. “It’s going so well, and it’s so much of what you wanted to put on tape that…you’re not nervous about every little variation,” he said of the experience. The first time Vanderslice was exposed to the material in its entirety was when he met with the group for rehearsals, three days before they were scheduled to record. After trying the music out together and getting it down, everyone then met up at Fantasy Studios in Berkeley, Calif., where they had booked two 10-hour days. Each song had only two takes, and at the end of that 48 hours, only the vocals remained to be finished. As for performances with the Magik*Magik Orchestra, fans will have to wait until this summer to witness the “White Wilderness” machine in its entirety. Taking into account the expenses of touring with so many people, as well as the organization of everyone’s schedule, it would be nearly impossible to pull off. Instead, the album’s true debut will happen in the Bay Area later this year. In the meantime, Vanderslice has already revealed that this won’t be the end of his collaboration with Magik*Magik. “And by the way, we’re doing our next record together too, so it’s like, definitely, we’re locked into this,” he said. This next album will focus more on the vocal choir aspect of things, even venturing so far as to have a few songs that don’t have any harmonic instruments on them. In light of talks of a new album already, Vanderslice said that the cycle of putting out records can be a double-edged sword, because of its propensity to be instable, something which he likened to playing a game of chess with yourself. Yet at the same time, he shared that the moment when he receives one of his records in the mail and and listens to it the very first time, it makes it all worth it.